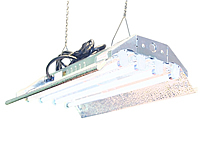 Fluorescent grow lights are inexpensive and efficient much like LED grow lights. They are very popular with indoor gardeners for these reasons. 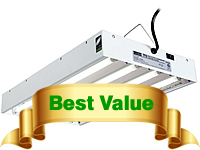 In the table below, there is a list of 10 of the best fluorescent grow lights based on customer ratings and feedback, as well as value for money. Cord Length 10 ft. 8 ft. 10 ft. 8 ft. 13 ft.
Dimensions 23" x 13.5" x 3" 18" X 10" X 4.5" 22.5" x 7.25" x 3" 47.5" x 12.5" x 4" 19" x 19" x 5"
Dimensions 23.5" x 12.5" x 4" 46" x 13.5" x 3" 19" x 19" x 5" 47.5" x 12.5" x 4" 21" x 14.5" x 9"
If you know little to nothing about about fluorescent grow lights, I recommend that you read this article here. Also, here are some tips and information on fluorescents. 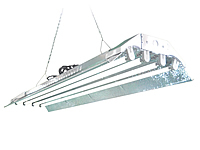 There are two types of fluorescent grow lights – Compact Fluorescents (CFL) which are designed in a round shape and T bulbs which are long straight tubes. 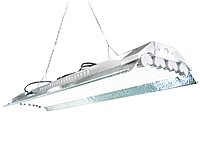 Fluorescent grow lights give off very little heat, so you place them as close to the plants as necessary. 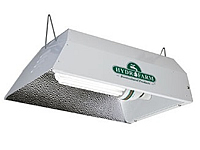 The construction of the hood allows you to hang the fluorescents vertically, which provides sideways lighting resulting in vegetable plants such as peppers and tomatoes to grow very tall. 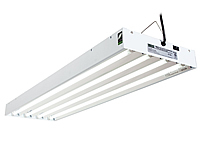 Fluorescent grow lights are great for evenly distributing light and doesn’t overload young plants. 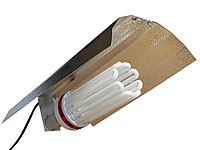 T bulb fluorescents are based on T numbers, and the higher the number, the wider the diameter of the bulb. The most popular size for growing plants is T5, because they’re small yet they still give off just as much lumens as bigger bulbs. 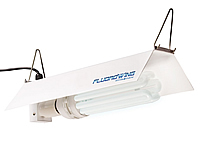 Fluorescent grow lights are energy efficient which means less costs on your electricity bills. The upfront cost is also cheap. 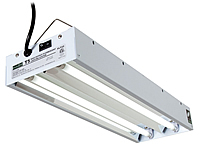 Just like with other grow lights, it’s important that you get a fluorescent grow light designed and manufactured by a reputable brand since they will have extensively tried and tested their bulbs to make sure that they have a long lifespan. 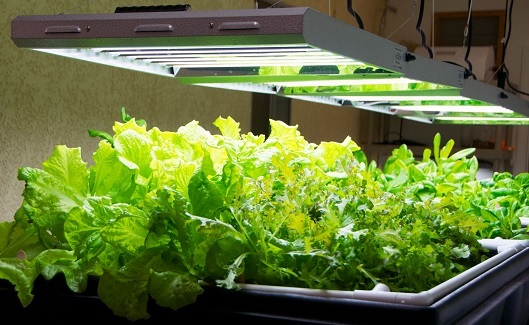 Even though they are inexpensive and energy efficient, fluorescent grow lights tend to diminish in spectrum power over time, therefore, plants will not grow as well since the light they need will be reduced, even though humans can still see the visible light. 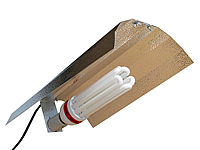 Therefore, it’s recommend that the bulbs are replaced every 6 months of continuous everyday use. Obviously if you use it less, then this time period could be extended. As a great alternative to fluorescents, LED grow lights share the same characteristics and their bulbs lasts longer too.